monday.com brings refined visual design to the team management space. This post is presented by monday.com. Anyone who does their work on a computer likely uses a team management platform like Slack, Hipchat, Asana or Trello. It’s a busy space, with lots of competition, so Israeli startup monday.com is leveraging colorful, adaptive, intuitive design to stand out from the crowd. The formula seems to be working. Within a year, monday.com has tripled its user base to more than 35,000 paid subscribers. That’s everything from freelancers at coffee shops to big teams at Fortune 500 companies. No less than McDonald’s, Adidas, Samsung, Uber, Discovery Channel and WeWork us this team management tool, which in July scored an impressive $50 million in series C funding. So what’s turning people on to monday.com? The goal of any team management platform is always to boost productivity and collaboration, improve communication, and centralize all workplace processes. What monday.com manages to do is to fold deep functionality into a simple — but not simplistic — design that’s a pleasure to interact with. The first thing that strikes the eye when opening a board is the colorful and beautiful interface. Everything functions clearly, logically and eye-pleasingly. The modular design means a variety of views can be added as desired. Charts, timelines, maps, even forms and kanban-style pipeline views are available. Team managers and members alike can customize their boards depending on the project. Different hues denote varying degrees of importance for a given task, so the eye can instantly sense the status of a workflow. It’s easy to stack and arrange views depending on the size of the team and the complexity of the task at hand. Boards are freely stackable, making it easy to assign and track tasks. monday.com keeps all communications on a given topic or task in rows called “pulses.” These update everyone connected to them as updates occur. You can even watch for updates in real time via a “pulse TV” view. Team members can easily move from granular to big-picture perspectives. This creates transparency for employees and managers, and reduces the problem of team siloing. The goal here is to empower employees and managers alike in a transparent, collaborative environment. 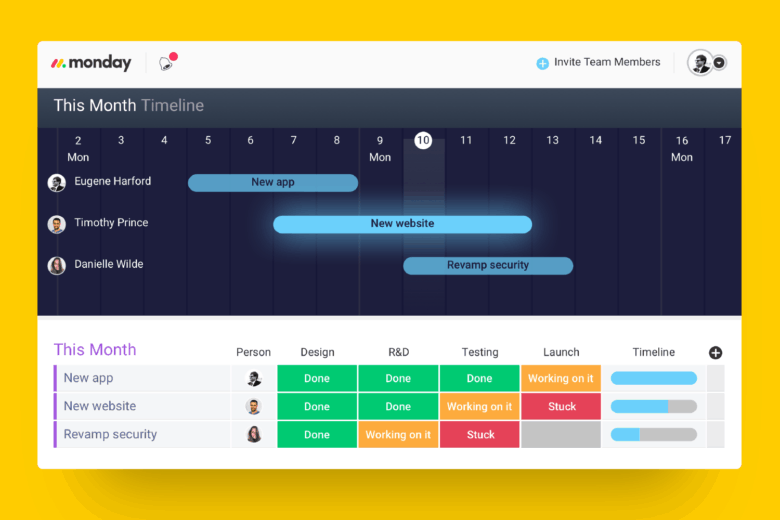 As tasks grow more complex, monday.com’s design opens up to meet those needs. Filters make for easy navigation of dense workflows. Permissions and integration with outside applications make for a high degree of flexibility. Review panes make for quick assessments of what’s complete and what’s still in the pipeline. All of these functions and more unfold from tabs peppered throughout the interface. The best way to get a sense for what sets monday.com apart from the rest of the herd is to get your hands on it. If you think your team would benefit from a more deeply integrated and intuitive team management tool, you can sign up for a free trial of monday.com.